Photo left-to-right: Gary McNeil, National Cable Specialists, VP and COO; Dan Drazilov, Affiliate Distributors Canada Electrical Division, President; Dennis Coutts, Habitat for Humanity Greater Vancouver, CEO; John Jefkins, Electro-Fed Canada, Vice President, Marketing & Communications. In Q1 2018 National Cable Specialists embarked on a fundraising initiative in support of ElectroFed’s Power to Build project. Teaming up with three manufacturers, Prysmian, Belden and Superior Essex, NCS contributed funds for every order placed by Affiliate Distributors (AD) Canada members. 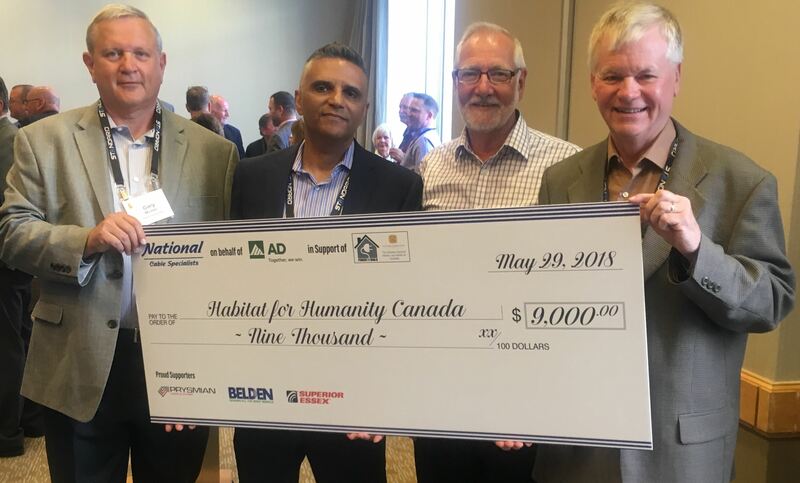 The initiative raised cdn$9,000 for Habitat for Humanity during the months of January, February and March of 2018. National Cable Specialists wishes to extend our sincere thanks to all participating AD members and our valued partners, Prysmian, Belden, and Superior Essex, for their generous support of this initiative.